The best time of year, soup season! Really I love every season, each one has things I love about them (although with winter, I wish it would just snow more often if it’s going to be cold. Maybe I should be careful what I wish for. I love when everything is covered with gorgeously white, glistening snow though). I’m getting so excited for fall and all the food and baking that comes with it! 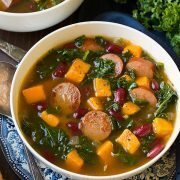 This isn’t exactly your typical fall soup, but it’s soup so I’m sure I’ll be making it plenty this fall – especially considering how much I loved it! Talk about biggest upgrade on a package of ramen noodles! 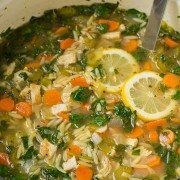 I know when I get a cold this season (which I wish I could say I won’t but every year I get a few) this is the soup I’ll be craving. 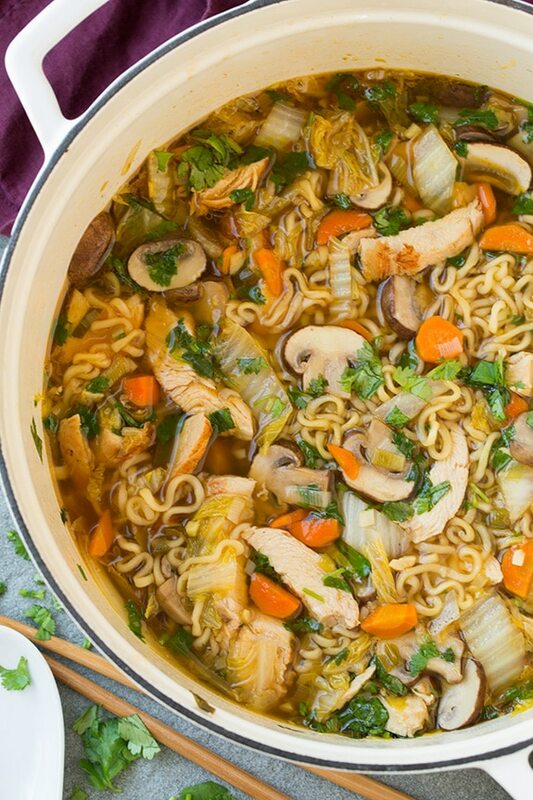 It’s packed with delicious flavors and it was a dinner my whole family loved. 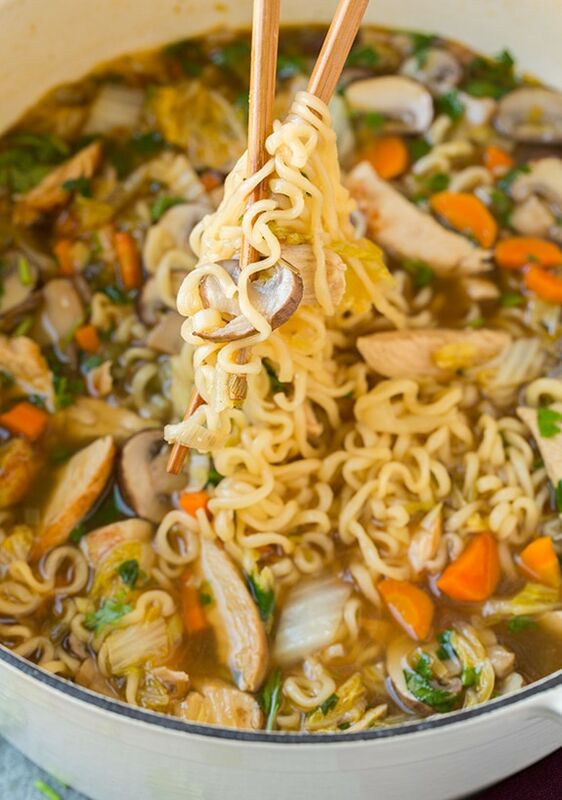 In case you were wondering which brand of ramen I used, I went with these here. I like that they are thicker noodles and they just seem more authentic. You can use any brand you’d like, if you use the smaller classic packages you find here in the U.S. (3 oz) then just do 1 1/2 pkgs. And of course, don’t add the seasoning packets. Also, if you can get your hands of fresh I’m sure that would be even better, they’re just hard to come by at your traditional grocery store (then of course you’ll probably need double or triple the amount since they aren’t dry and dehydrated). Then just FYI, I did ladle out about 1 1/2 cups of the broth from the pot of soup for these pictures, just so you could see more of what’s in the soup – so expect a slightly more broth-y soup than what you see here. 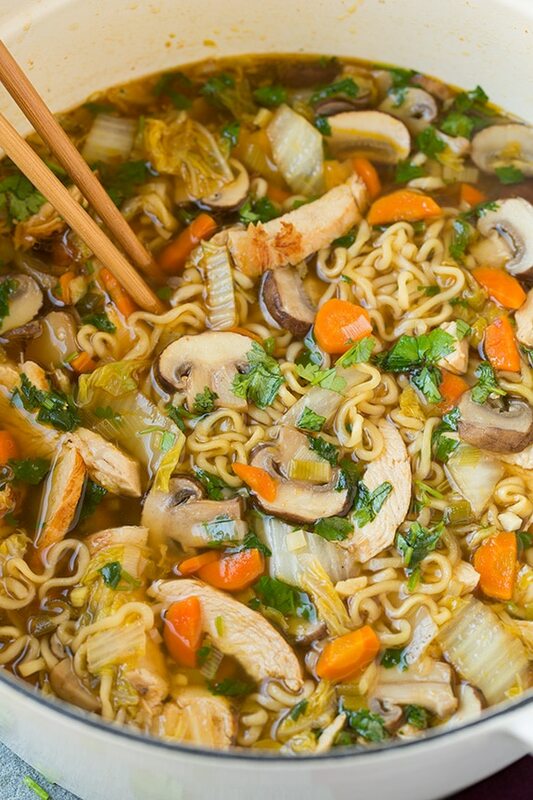 You can begin with less though if don’t think you’d like much broth or just add some extra ramen. Enjoy! 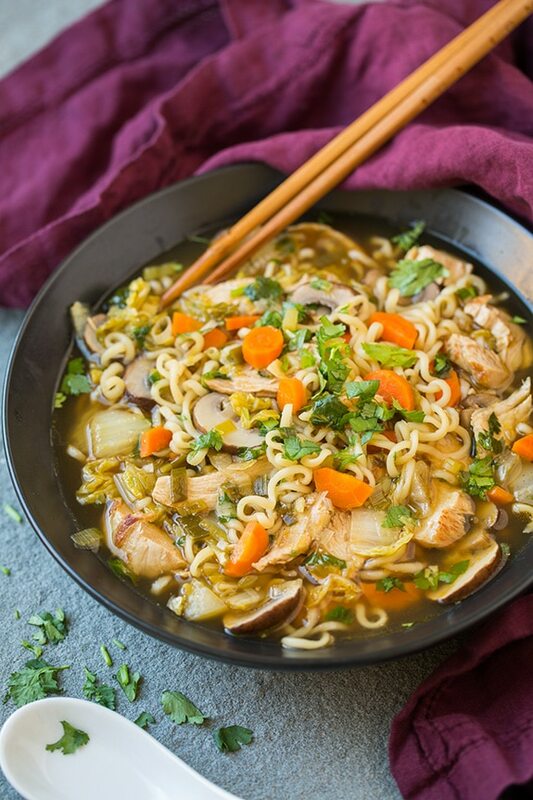 Chicken noodle soup with a delicious Asian flair! 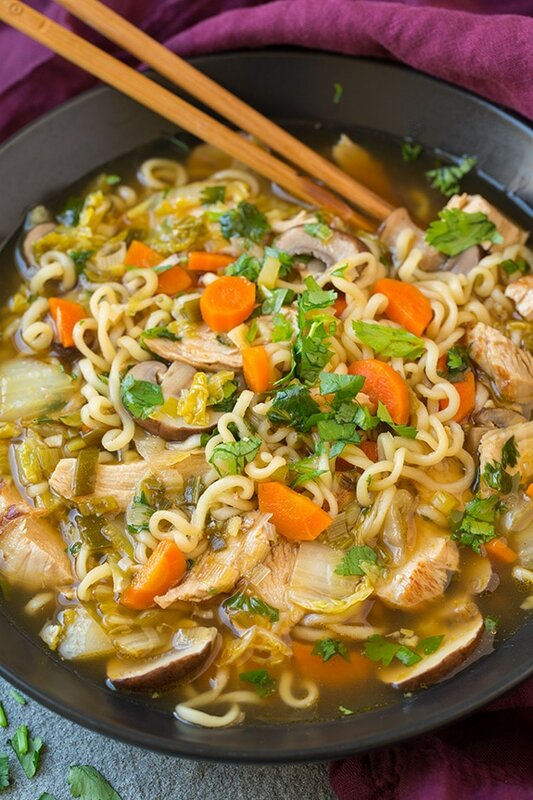 Made with lot of fresh veggies, protein rich chicken, hearty ramen and a deliciously seasoned broth. Heat 1 Tbsp vegetable oil in a large non-stick skillet over medium-high heat. Add carrots and saute 3 minutes then add green onions, garlic and ginger and saute 2 minutes longer, set aside. Cover chicken with plastic wrap and pound to an even thickness using the flat side of a meat mallet. Heat 1 Tbsp olive oil in a large cast iron dutch oven over medium-high heat. Season both sides of chicken lightly with salt and peper, then add to pot and cook until browned on both sides, about 2 1/2 minutes per side. 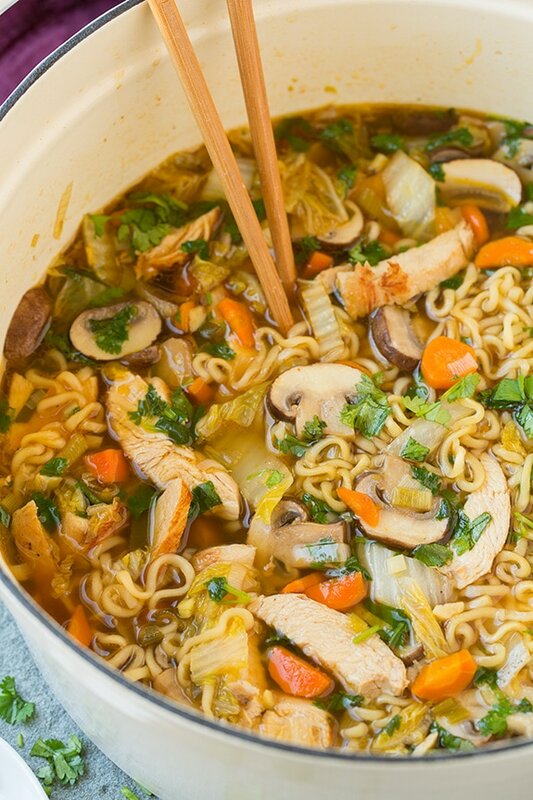 Pour in chicken broth, soy sauce, mirin, rice vinegar, Sriracha, and sesame oil, then pour carrot mixture into soup mixture. Bring to a boil then reduce heat to medium-low, cover and simmer until chicken has cooked through (center should register 165 degrees on an instant read thermometer), about 5 - 7 minutes. 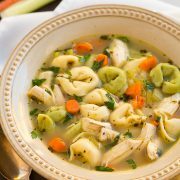 Remove chicken breasts from soup and transfer to a cutting board and let rest 5 minutes then cut into strips. Meanwhile, stir in sugar, cabbage and mushrooms and return soup to a boil. Add noodles and cook 3 - 5 minutes longer until noodles are tender. Stir in chicken. Serve warm sprinkled with cilantro.